A email note two days back from a personal friend provided the trigger for me to finally get to writing this slow-gestating post drawing links between the armed struggle by coal miners in the US in 1921 with the current armed battles of the Adivasi (indigenous) peoples of India. Recent developments also permit me to tie in another struggle, one some ‘rades of mine in Appalachia are involved in, the struggle against “mountaintop removal” coal mining. Do you all know of anyone or any organization who will work with families fighting big oil/gas companies from land grabbing? I was just informed by my brother in New Orleans that some land that my family has owned in Mississippi since apparently right after Emancipation is being threatened. They want to pressure my mother and uncle to sign some "lease" agreement to do exploratory drilling (basically, fracking). It's a crazy situation which resembles the "Boss Hogg" setup--good ole boys network all the way up to the courts and legislative bodies out there. The battle against this kind of land theft by mineral-hungry monopoly capitalists is something pushed to the forefront of my mind about when I read Indian literary luminary Arundhati Roy’s recent article “Walking With The Comrades.” In it she describes spending weeks with guerrillas under the leadership of the Communist Party of India (Maoist) in the densely forested areas of Central India where the various Adivasi peoples, know to the Indian government as “Tribals,” live traditional lives. Their problem is that these forests, it turns out, cover huge mineral deposits coveted by Indian monopolists like the Tata group and foreign transnationals like Arcelor Mittal and Posco. Over the past five years or so, the governments of Chhattisgarh, Jharkhand, Orissa and West Bengal have signed hundreds of MoUs [Memorandum of Understanding—FotM] with corporate houses, worth several billion dollars, all of them secret, for steel plants, sponge-iron factories, power plants, aluminium refineries, dams and mines. In order for the MoUs to translate into real money. tribal people must be moved. Anyone familiar with the history of the First Nations in the U.S. knows what comes next: oh-so-sincere expressions of concern. 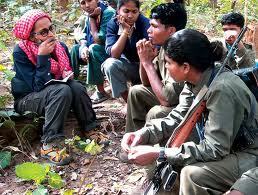 Adivasis must be “brought in the mainstream” and permitted to enjoy “the fruits of modern development.” Somewhere else. First came the railroad agents. My Papaw, Henry Marcum had refused to sign the papers giving the minerals to the railroad…The railroad men claimed they owned all the land, had bought it off somebody in Philadelphia whose papaw had fought in the Revolutionary War and had been given it as a gift. According to them, they owned most of Justice County, and McDowell County too. Then they’d come around, fat, smooth-faced men in black suits and vowed they’d leave us the land if we’d sign over the minerals. Henry Marcum spoke to the railroad lawyers. When he told them about the deed he held at the courthouse, they laughed at him. Junior patent, they kept saying. Senior patent is what we own. That takes precedence. Ask any judge. The judges we was supposed to ask was a far way off, so most folk signed. The railroad men vowed they’d not bother us no more. And they kept their word. They sold the mineral rights to the coal companies and the local sheriffs started evicting people at gun-point two years later. In India right now, poorly armed guerrillas based in extremely rural areas are waging desperate battles--with surprising success--against the armed forces of a huge, well-armed modern state. In the Appalachians, armed resistance was sporadic and largely individual in character for decades, but in 1921, the dispossessed, now miners--wage labor in the coal tunnels under the land stolen from them—erupted in fury. 79 years ago today, forward detachments of miners whose leaders and whose defenders in elected office had been gunned down by coal company thugs, were on the move, seeking to punch through the ring of official and hired terror surrounding Mingo and Logan Counties and bring the union in. 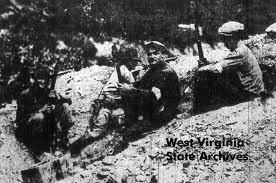 By the 29th of August, 1921, 15,000 armed miners were in combat on Blair Mountain, West Virginia with gun thugs and police, backed by US bombers ordered in by President Warren Harding. Deciding they couldn’t defeat the U.S. military in pitched battle, the miners withdrew after several days of chaotic combat. Ironically, Blair Mountain is once again the focal point of intense struggle. The descendants of the railroad and mining operators who grabbed the mineral rights and evicted the rural people over 100 years ago, now want to blast the top off Blair Mountain to strip the coal out. This is called mountaintop removal. It is capital intensive and low labor, and in particular it is ecologically devastating, with the rock covering the coal seams, the overburden, blasted and dumped in adjacent valleys and stream beds. And the broad movement to stop mountaintop removal is making the historic nature of the Blair Mountain battlefield an issue. Archaeologists and hobbyists find old firearms and loads of spent bullets on the mountain--over a million rounds were fired during the battle. Cecil Roberts, president of the United Mineworkers of America has called for its preservation as a historic site--the last major upsurge before the drives of the 1930s finally unionized the Appalachian coalfields. Last week, Fire on the Mountain carried an outraged article about Whirlpool Corporation grabbing a public park in Benton Harbor, Michigan to build a luxury homes and a golf course. We should be just as outraged at the far more common seizure of land by mining and oil companies, be it at the expense of small Black landowners, whole indigenous peoples, or history itself. Join us on September 25-7 in Washington, D.C. at Appalachia Rising, a mass mobilization calling for the abolition of mountaintop removal and surface mining. Appalachia Rising is is a national response to the poisoning of America’s water supply, the destruction of Appalachia’s mountains, head water source streams, and communities through mountaintop removal coal mining. It follows a long history of social action for a just and sustainable Appalachia. Appalachia Rising strives to unite coalfield residents, grass roots groups, individuals, and national organizations to call for the abolition of mountaintop removal coal mining and demand that America’s water be protected from all forms of surface mining. Appalachia Rising will consist of two events. First, the weekend conference, Sept. 25-26, Appalachia Rising, Voices from the Mountains will provide an opportunity to build or join the movement for justice in Appalachia through strategy discussions and share knowledge across regional and generational lines. The second event on Monday, Sept.27, is the Appalachia Rising Day of Action which will unify thousands in calling for an end to mountaintop removal and all forms of steep slope surface mining though a vibrant march and rally. An act of dignified non-violent civil disobedience will be possible for those who wish to express themselves by risking arrest. I read Denise Giardina's excellent historic novel about the 1921 Blair Mountain War, "Storming Heaven" some years ago. One important historic feature of this struggle that Giardina barely touches on is the role of convict labor in the mine owners' attempts to use racism to divide the workers. Yes, the author touches on this bosses' tactic, but through the introduction of a few singular Black characters. The role of "vagrancy laws" and forced prison-labor gets barely a mention. Vagrancy laws were the basis for chain-gangs, but forget your "Cool Hand Luke" romantic image of imprisoned highway workers. After Reconstruction, vagrancy laws were the method by which any African-American could be arrested and imprisoned for the crime of having no job. And though these imprisoned workers may have labored on road-crews and at state farms, they were mainly contracted out by the state to work in mines, turpentine forests, and industrial jobs. Newark's Celebrity Mayor: Wrong Again!